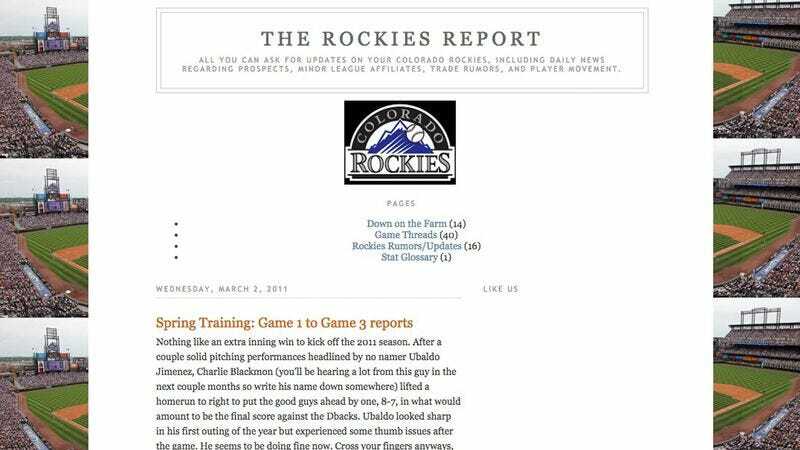 FORT COLLINS, CO—Noting that the site devoted to the Colorado Rockies and their minor league affiliates had long ceased being updated without any explanation, sources confirmed Friday that local man Ben Gutowski’s defunct four-year-old sports blog, “The Rockies Report,” was still quietly lurking on the internet. “Ubaldo Jimenez looked extremely sharp in five innings of work, so he looks poised for another All-Star season that will hopefully help push us back into the playoffs,” read an excerpt of Gutowski’s most recent post on the inactive Blogspot page, dated March 2, 2011, covering the Rockies’ spring training games. “Meanwhile, Wilin Rosario (remember that name, because he’ll be leading the NL MVP race in a couple years) has been killing it in Double-A with the Tulsa Drillers, so he could be a game-changer later in the year when he gets called up to the majors. Check back next week for a complete position-by-position breakdown of the roster, the latest Prospect Power Rankings, and a list of potential offseason moves the team could still try to make before the season starts.” Reports also stated that the long-dormant blog contained a poll asking readers which team would win the NL West division in 2011, which as of press time had received one vote.